And now, for some exciting uses for blue mesh tarps. These mesh tarps which do come in mass quantity, are a lot like the green, but, their protection factor is up. These are one hundred percent rain proof, and they include arctic flexibility. That's how protective they can be, so, of course, this has implications on what they should be used for and what not. So, when one thinks what a green cover would be useful for, because blue is a darker color, its uses run to the more protective. The mesh tarps do not let in as much light, but that would also make them less heat insulating, because light can not penetrate as much. Similar to their green mesh tarps, these covers will make a sturdy snow fence. But, the blue ones are used to protect motorcycles, for barbeque covers, leaf covers, boat covers, ice rink liners, as in the green. 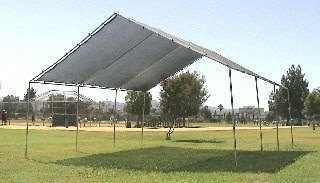 Tents, baseball and gym floor covers, truck, lumber, and hay covers. The blue covers are rope-reinforced, and, as such, are stronger than their green counterparts. They are water, mildew, and tear resistant. They are ultraviolet-treated on all sides. They are also acid resistant. They are a lot more rugged than the other color tarps, which is a pro and a con. In colder temperatures, they will shelter and protect what one owns more; that's the good aspect.